What is a Golf Hook, How Do I Fix a Golf Hook? Even the greatest golfers among us know the frustration of the dreaded hook. You feel like you’re making a straight, powerful swing, then watch with horror as your ball veers sharply off course. Every golfer is eager to stop hooking the golf ball once and for all. In order to do that, you need to understand what mistakes you’re making and how to fix them. I am going to walk you through some quick tips that will help you finally rid yourself of the hook. I will explain what the golf hook is, break down the science behind it, and teach you how to avoid it. When you don’t fully understand it, it’s easy to feel like the golf hook is just an inevitable part of your game. Fortunately, a little knowledge goes a long way to stop hooking the golf ball and start shooting nice, long draws. First things first: let’s make sure we’re on the same page about what a golf hook is. If you’re right-handed, a golf hook is when your ball starts out on a straight flight path, then veers sharply to the left. If you’re left handed, your ball veers to the right. In both cases, a hook shot is also characterized by a lower-than-usual ball flight. The golf hook is a source of endless frustration for many golfers, because it takes you off your target path and adds unnecessary strokes to your game. The first step in fixing your golf hook is to understand why it happens in the first place. To help explain the science behind this aggravating habit, I used the launch monitor at the Todd Kolb Golf Academy to measure the stats of my shot. Then, I attempted a deliberate hook shot. Now, it’s pretty rare for me to hook the ball these days. Nevertheless, I’ve hooked it enough in the past to remember how it’s done. Sure enough, I managed to get my ball veering to left of my target path. The golf ball also had a much lower trajectory than it typically does. I checked out my stats on the launch monitor. 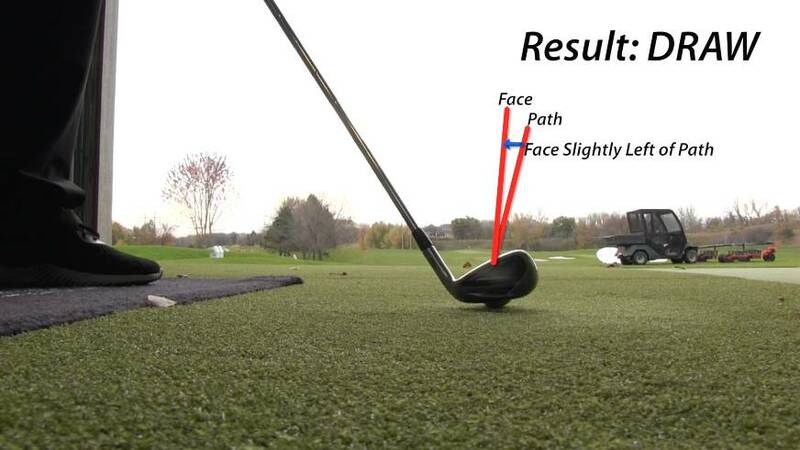 There are two factors that dictate the curve of a golf shot: the angle of the club path and the angle of the clubface. Looking at the launch monitor, I saw that the path of my club was angled 8.8 degrees to the right of my target line. 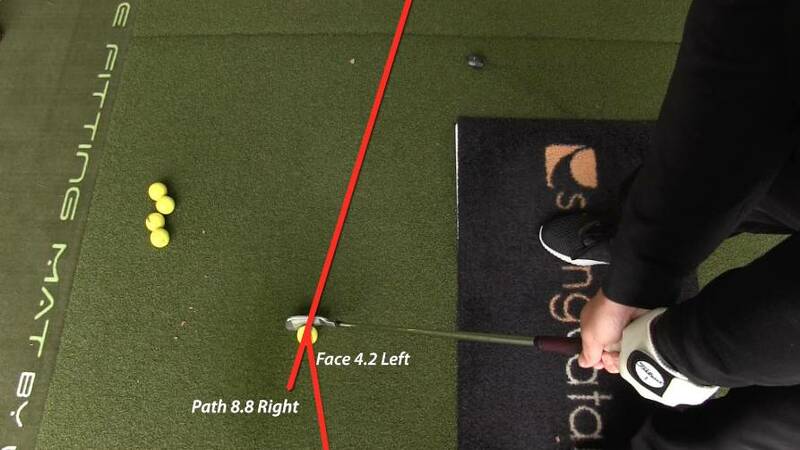 The clubface was angled 4.2 degrees to the left. Essentially, my ball got one set of instructions from the path of my swing and a separate set of instructions from my clubface. There was a 13-degree disparity between both sets of instructions. You’d be confused about where to go, too. To give this problem a little more context, let’s talk about what happens when you hit a draw. A draw, as you probably know, is when the ball curves gently to the left (for a right-handed golfer). Rather than veering wildly off course, it’s a solid, controlled shot. 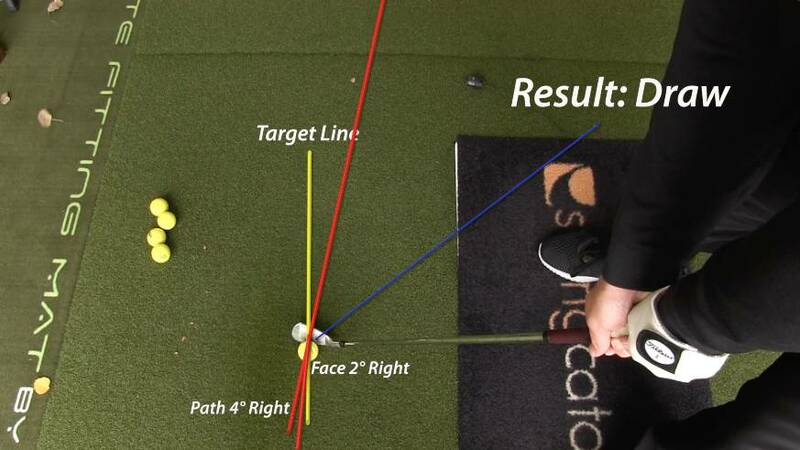 In order to hit a draw, you want your club path angled 4 degrees to the right and your clubface angled 2 degrees to the right, relative to the target line. You see the problem? The disparity is fairly large. More than that, my clubface angle is too far to the left. So if you’re consistently hooking the ball, your stats probably look a lot like mine. Now, let’s talk about how you can go about fixing numbers like that. The key to stopping your hook is to make sure the clubface is square to the target path at impact. There are two simple ways to make that happen. First, make sure your clubface is square to the target path at address. 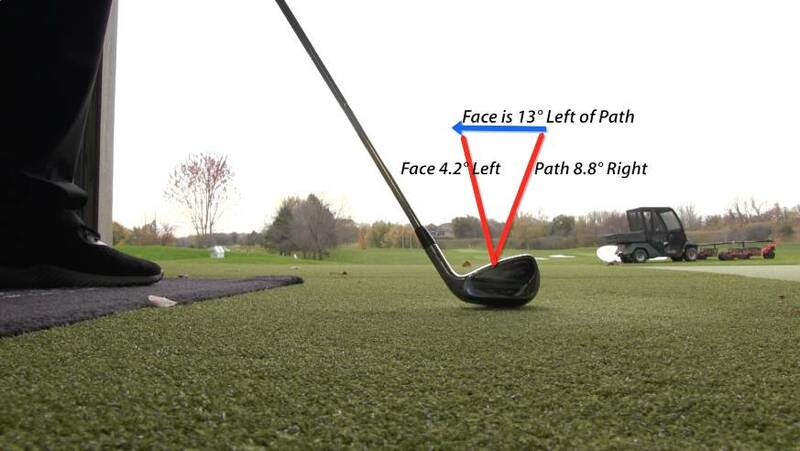 Many amateur golfers have the clubface closed without realizing it when they set up their shot. The face turns inward towards the left for right-handed golfers or towards the right for left-handed golfers. A closed clubface just about guarantees you’ll hook the golf ball. If you’re not sure whether your clubface is square, lift the club straight out in front of you at eye-level. Look at the leading edge of the clubface. If that edge is straight up and down, the clubface is square. Keep the club in that position as you lower it back down and take your setup. The second thing you’ll want to notice is your grip on the club. Some golfers have what we call a “strong grip.” That might sound impressive, but it’s actually a bad habit that results in a closed clubface at impact. 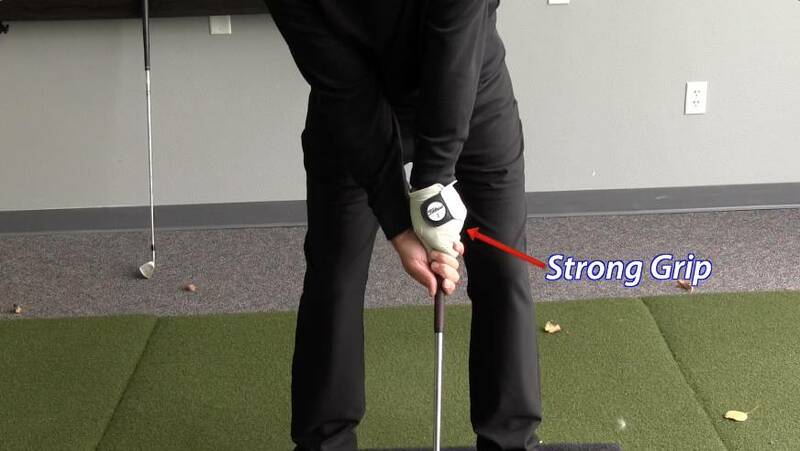 If you’re right-handed, a strong grip means your lead hand is turned well to the right. Your trail hand is turned under. What you want instead is a neutral grip. 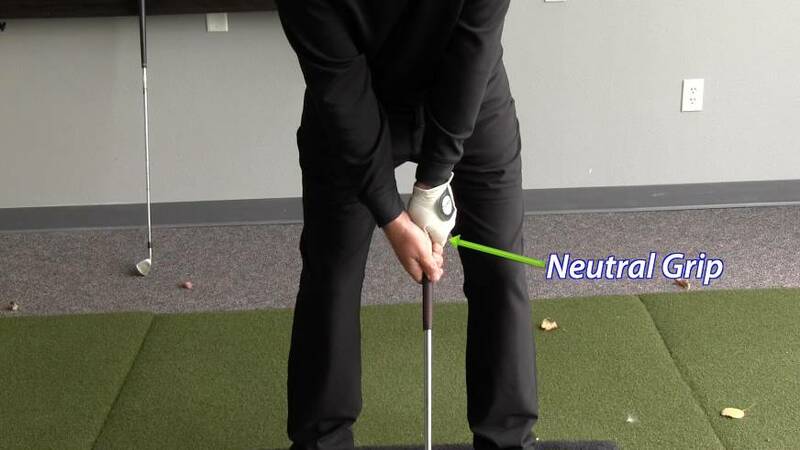 So, take note: If your grip seems to be twisting back and under, you are setting yourself up for the dreaded hook shot. Neutralize your grip, and you have a much better shot at a draw. A hook shot is a golf shot in which the ball veers sharply off course. For right-handed golfers, a golf hook veers to the left. For left-handed golfers, it veers to the right. A golf hook is also defined by a lower trajectory. The cause of a golf hook is 1) a disparity between the angle of the club path and the angle of the clubface and 2) a closed clubface. Ensure that the clubface is square to the target path at address. Maintain a neutral grip on the club. Practice incorporating this advice into your golf shots, and you should start to see improvement. Before you know it, those golf hook shots will become an irritating rarity instead of a relentless reality. Have you been struggling with a golf hook? What advice have you tried? Do you have any questions? Let us know what has and has not been working for you. We’re always happy to field your questions and talk golf!